This article was written before India and the U.S. met this last week to finalize defense agreements that involve, among other things, sharing advanced satellite data for navigation and missileg targeting. This step is something that India didn't want to do until recently when they realized the dangers of China's expanding security and economy, and the us was concerned after observing the transactions India had made with Russia. WASHINGTON/NEW DELHI: The United States and India will seek to finalize a number of defense agreements during high-level talks this week that aim to draw their two militaries closer and counter-balance China's influence in the region. U.S. defense secretary Jim Mattis and secretary of state Mike Pompeo will hold talks with foreign minister Sushma Swaraj and defense minister Nirmala Sitharaman for the two-plus-two discussions. Already cancelled twice this year, it is the highest level of dialogue between the two countries and was agreed upon by us President Donald Trump and Prime Minister Narendra Modi last year. Officials and experts believe that the meeting is not only symbolically important, but will give the world's two largest democracies a chance to make concrete progress while ironing out significant differences, including over India's ties with Russia and Iran. The 2+2 presents a historic opportunity to develop our growing partnership and to explore ways of enhancing our security cooperation" the top us military officer, Marine General Joseph Dunford, told reporters travelling with him to the talks. Randall Schriver, the Pentagon's top Asia official, predicted last week that the discussions would produce "a set of actual concrete outcomes." India has been alarmed at China's expanding security and economic links in South Asia. The nuclear-armed Asian giants were locked in a 10-week military stand-off last year in a remote, high-altitude stretch of a boundary in the Himalayas. Earlier this year, the us military renamed its Pacific Command as the us Indo-Pacific Command, a move underscoring the growing importance of India to the Pentagon. "That would be a big deal, if that announcement comes out of this ... in terms of advancing the interoperability, that would really be a kind of big next step" said Alyssa Ayres, a former us state department official and now a senior fellow at the Council on Foreign Relations. The United States is keen to tap into India's large defense market. It has emerged as India's No. 2 weapons supplier, closing $15 billion worth of deals over the last decade. A senior U.S. defense official, speaking on the condition of anonymity, said the two countries were looking at carrying out a major joint exercise — involving troops on land, at sea and in the air. Further details were not immediately available. The two countries hold elaborate navy-to-navy manoeuvres, air exercises and even drills involving special forces, but war games involving all three arms represent a scaling up of defense cooperation. "India wonders about the coherence of U.S. strategy and worries the U.S. is pursuing policies inimical to key Indian interests like its continued dependence on Russian military hardware and Iranian oil" said Sameer Lalwani, co-director of the South Asia program at the Stimson Center think tank in Washington. The United States is concerned about India's planned purchase of Russian S-400 surface-to-air missile systems. The United States has imposed sweeping sanctions on Russia, under which any country engaged with its defense and intelligence sectors could face secondary us sanctions. However, a new defense bill gives the president the authority to grant waivers in case of national security interests. For months, the two sides have been aiming to reach an agreement on the deal before Russian President Vladimir Putin's visit to India, planned for early October for annual summit talks. Here are the results of the meeting that took place this last week including the pledge that was made including, "The two sides further reaffirmed their commitment to ongoing and future cooperation to ensure a stable cyberspace environment and to prevent cyber-attacks." NEW DELHI: India and United States of America on Thursday pledged to expand their bilateral trade and economic partnership with a view to promoting investment and job creation at the first ever India-US ministerial 2+2 dialogue. 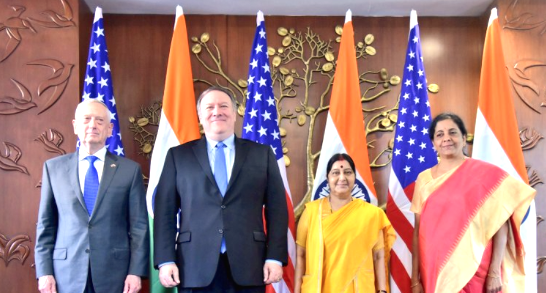 The long-awaited event took place between the senior leadership where Minister of External Affairs Sushma Swaraj and Minister of Defence Nirmala Sitharaman welcomed their US counterparts Secretary of State Michael R. Pompeo and Secretary of Defense James N. Mattis (see photo below right). The ministerial dialogue was announced by the US in August 2017. A copy of the joint-statement released by the U.S. Department of State is given below. Minister of External Affairs Sushma Swaraj and Minister of Defence Nirmala Sitharaman welcomed Secretary of State Michael R. Pompeo and Secretary of Defense James N. Mattis to India on September 6, 2018, for the inaugural U.S.-India Ministerial 2+2 Dialogue. They welcomed the launch of the 2+2 Dialogue as a reflection of the shared commitment by Prime Minister Modi and President Trump to provide a positive, forward-looking vision for the India-U.S. strategic partnership and to promote synergy in their diplomatic and security efforts. They resolved to continue meetings in this format on an annual basis. Celebrating over 70 years of diplomatic cooperation, the Ministers reaffirmed their view that India and the United States, as sovereign democracies founded on the values of freedom, justice, and commitment to the rule of law, must continue to lead global efforts to promote peace, prosperity, and security. Recognizing their two countries are strategic partners, major and independent stakeholders in world affairs, the Ministers committed to work together on regional and global issues, including in bilateral, trilateral, and quadrilateral formats. The two sides further decided to establish secure communication between the Minister of External Affairs of India and the U.S. Secretary of State, and between the Minister of Defence of India and the U.S. Secretary of Defense, to help maintain regular high-level communication on emerging developments. The Ministers reaffirmed the strategic importance of India’s designation as a Major Defense Partner (MDP) of the United States and committed to expand the scope of India’s MDP status and take mutually agreed upon steps to strengthen defense ties further and promote better defense and security coordination and cooperation. They noted the rapid growth in bilateral defense trade and the qualitative improvement in levels of technology and equipment offered by the United States to India in recent years. They welcomed the inclusion of India by the United States among the top tier of countries entitled to license-free exports, re-exports, and transfers under License Exception Strategic Trade Authorization (STA-1) and also committed to explore other means to support further expansion in two-way trade in defense items and defense manufacturing supply chain linkages. They welcomed the signing of a Communications Compatibility and Security Agreement (COMCASA) that will facilitate access to advanced defense systems and enable India to optimally utilize its existing U.S.-origin platforms. The Ministers also announced their readiness to begin negotiations on an Industrial Security Annex (ISA) that would support closer defense industry cooperation and collaboration. Recognizing their rapidly growing military-to-military ties, the two sides committed to the creation of a new, tri-services exercise and to further increase personnel exchanges between the two militaries and defense organizations. The Ministers reviewed the recent growth of bilateral engagements in support of maritime security and maritime domain awareness, and committed to expand cooperation. Toward that end, the Ministers committed to start exchanges between the U.S. Naval Forces Central Command (NAVCENT) and the Indian Navy, underscoring the importance of deepening their maritime cooperation in the western Indian Ocean. Acknowledging the unique role of technology in the U.S.-India defense partnership, the Ministers reaffirmed their commitment to continue to encourage and prioritize co-production and co-development projects through the Defense Technology and Trade Initiative (DTTI), and to pursue other avenues of defense innovation cooperation. In this regard, they welcomed the conclusion of a Memorandum of Intent between the U.S. Defense Innovation Unit (DIU) and the Indian Defence Innovation Organization – Innovation for Defence Excellence (DIO-iDEX). Welcoming the expansion of bilateral counter-terrorism cooperation, the Ministers announced their intent to increase information-sharing efforts on known or suspected terrorists and to implement UN Security Council Resolution 2396 on returning foreign terrorist fighters. They committed to enhance their ongoing cooperation in multilateral fora such as the UN and FATF. They reaffirmed their support for a UN Comprehensive Convention on International Terrorism that will advance and strengthen the framework for global cooperation and reinforce the message that no cause or grievance justifies terrorism. The Ministers denounced any use of terrorist proxies in the region, and in this context, they called on Pakistan to ensure that the territory under its control is not used to launch terrorist attacks on other countries. On the eve of the 10-year anniversary of the 26/11 Mumbai attack, they called on Pakistan to bring to justice expeditiously the perpetrators of the Mumbai, Pathankot, Uri, and other cross-border terrorist attacks. The Ministers welcomed the launch of a bilateral dialogue on designation of terrorists in 2017, which is strengthening cooperation and action against terrorist groups, including Al-Qa’ida, ISIS, Lashkar-e-Tayyiba, Jaish-e-Mohammad, Hizb-ul Mujahideen, the Haqqani Network, Tehrik-i-Taliban Pakistan, D-Company, and their affiliates. The two sides further reaffirmed their commitment to ongoing and future cooperation to ensure a stable cyberspace environment and to prevent cyber-attacks. The Ministers reviewed cooperation in the Indo-Pacific region, noting that the common principles for the region articulated in the India-U.S. Joint Statement of June 2017 have been further amplified by President Donald Trump at Danang, Vietnam on November 10, 2017, and Prime Minister Narendra Modi in Singapore at the Shangri-La Dialogue on June 1, 2018. Both sides committed to work together and in concert with other partners toward advancing a free, open, and inclusive Indo-Pacific region, based on recognition of ASEAN centrality and on respect for sovereignty, territorial integrity, rule of law, good governance, free and fair trade, and freedom of navigation and overflight. Noting the importance of infrastructure and connectivity for the Indo-Pacific region, both sides emphasized the need to work collectively with other partner countries to support transparent, responsible, and sustainable debt financing practices in infrastructure development. The Ministers reaffirmed their shared commitment to a united, sovereign, democratic, inclusive, stable, prosperous, and peaceful Afghanistan. The two sides expressed support for an Afghan-led, Afghan-owned peace and reconciliation process. 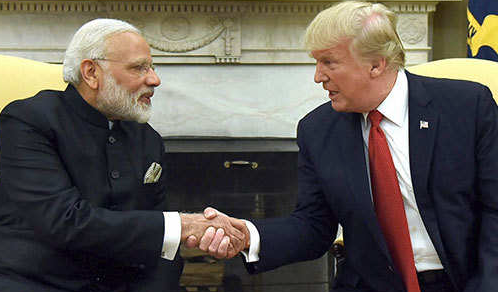 The United States acknowledged India’s longstanding and ongoing contributions of economic assistance to Afghanistan and also welcomed India’s enhanced role in Afghanistan’s development and stabilization. India welcomed the recent U.S.-North Korea summit. The two sides pledged to work together to counter North Korea’s weapons of mass destruction programs and to hold accountable those countries that have supported them. The United States welcomed India’s accession to the Australia Group, the Wassenaar Arrangement, and the Missile Technology Control Regime and reiterated its full support for India’s immediate accession to the Nuclear Suppliers Group. The Ministers recognized the importance and the potential for increasing bilateral trade, investment, innovation, and job creation in both countries. Both sides committed to further expanding and balancing the trade and economic partnership consistent with their leaders’ 2017 joint statement, including by facilitating trade, improving market access, and addressing issues of interest to both sides. In this regard, both sides welcomed the ongoing exchanges between the Ministry of Commerce of India and the Office of the United States Trade Representative and hoped for mutually acceptable outcomes. Both sides looked forward to full implementation of the civil nuclear energy partnership and collaboration between Nuclear Power Corporation of India Limited (NPCIL) and Westinghouse Electric Company for the establishment of six nuclear power plants in India. Observing the strong ties of family, education, and business, and the spirit of entrepreneurship and innovation that unite their people, the Ministers highlighted the unmatched people-to-people ties between their countries and recognized the benefits to both nations and the world from these ties, including the free flow of ideas and collaboration in health, space, oceans, and other areas of science and technology. The next 2+2 meeting is to be held in the United States in 2019.